Last fall, I had the strange urge to see if I could buy a tank. I knew that owning a tank in America was politically incorrect, not to mention a possible issue with the folks at Homeland Security. But I put those concerns aside for a while, because I was in the Czech Republic. First, I wanted to see if I could buy a tank. Then I’d worry about getting it home. Elsewhere, when I finally stood on the turret of a T-72 – the Russian-built tank that is sort of the gazelle of modern combat tanks – beautiful was not the word that sprang to mind. Dangerous was more like it. But then, danger has its own undeniable beauty. No. By then, I was interested only in what we stood on, or balanced on – Doshkov was on the long barrel, arms crossed. That is, a T-72. 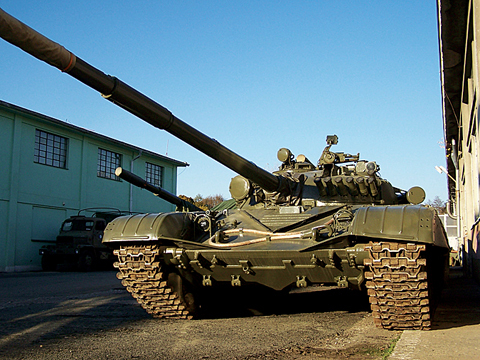 In case you don’t know your tanks, the T-72 was the Cold War tank of the Russians. It’s lean and fast; one was reportedly clocked at 68 mph alongside a German autobahn. The main gun is a 125-mm cannon about fifteen feet long that can be fired on the move, accuracy guaranteed by a laser range finder. There’s an infrared spotlight, an NBC package (that’s your comprehensive nuclear, biological, and chemical protection), and a boron-lined turret to block nuclear radiation. The engine in late-model T-72s is a multifuel V-12, supercharged and water-cooled, rated at 840 hp. Cruising speed is 25 mph, depending on the terrain, and range is 300 miles, although auxiliary fuel tanks push that past 500. There is also an amphibious package that includes a peri-scope and a snorkel; it gives you the option of submarining in sixteen feet of water, although the turret might leak. That’s when the sense of absurdity began to kick in. 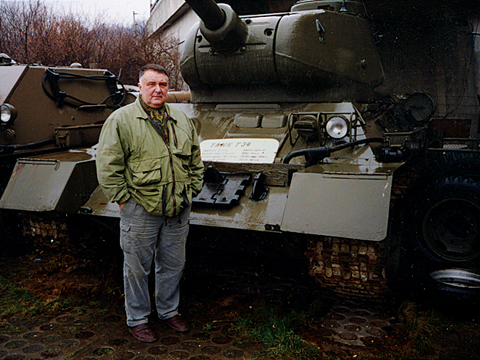 Completely rebuilt, with smoke-grenade launchers, an antiaircraft-gun mount, and rubber skirts over the treads to keep down mud spatter, this Russian tank – or a few micron-sized slivers of it, anyway – had been bought with my tax dollars. And yes, the amiable salesman told me, I could own one just like it. 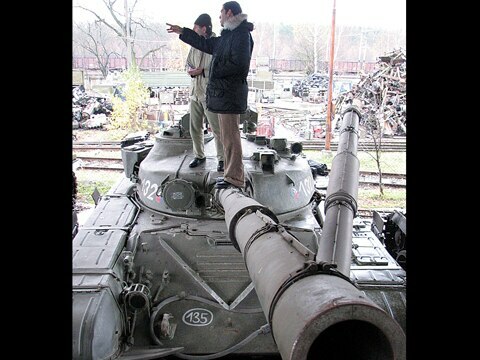 A bit incredulous, I said, “Can a guy like me get a tank like this into the United States?”Doshkov wasn’t sure. 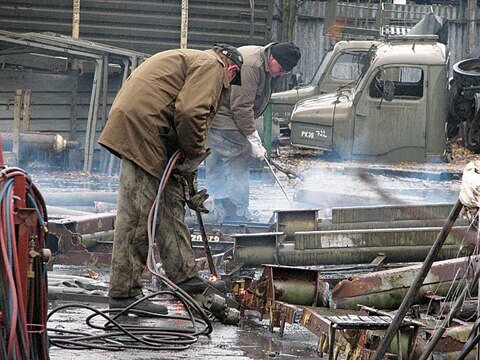 “Just yesterday,” he said, “I sold an older Russian tank, a T-55, to a collector in New Zealand. Nothing needed to be done to it.” The cannon didn’t need to be spiked or cement poured into the engine compartment or ugly little windows cut out of the turret, defacing the tank, to satisfy some nation’s security rules. I knew the feeling. Awkwardly, I slid down into the gunner’s slot, 160 pounds of protoplasm into 49 tons of steel. 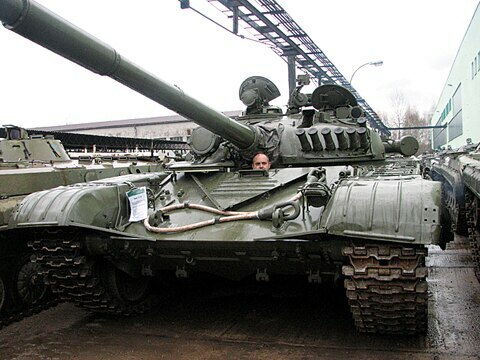 My immediate impression was that ergonomics are not a strong point of a T-72, but claustrophobia is. There was a gun sight before my eyes, a cannon breech by my elbow, an aura of lethal power all around. “It must be noted that a human being in close proximity to the breech block of a 2A46 cannon when it is fired will find the event difficult to ignore or forget.” That came from a Wikipedia contributor. Staring at the breech block, which was the size of a small safe, and imagining the recoil, I believed the author. Next, Doshkov had me slide into the commander’s seat in order, as he put it, “to savor the full tank experience.” Speaking to the top of my head, he said it was too bad I’d missed this year’s “Tank Power Days” at Excalibur Army, when a variety of tanks were on display and rides were available. “You will come back in the spring and take a drive,” he said encouragingly. I was busy looking through the commander’s prismatic periscope. I couldn’t see a thing. Fiddling with the communications gear and some switches, I got grease on my hands. I wiped them on my pants and found Doshkov blocking my way out, the sheltering blue sky framing his head. He brushed the foamy interior of the turret and said, “Anti-nuclear material. Nobody knows exactly what it is.” Actually, they do know, I thought, having done some homework. It was boron and a mix of metals, lead, plastic, and glass to block radiation from blasting your mitochondria. “Nice feature,” I said, touching the stuff. A second salesman, a character named Spitka, joined us on the crowded turret. Spitka, who wore full camo and combat boots, had flown MiGs in Afghan-istan in the ’80s. He smiled a lot and had a quirky, perverse sense of humor. Spitka asked me why Americans are so fat, why we have slow speed limits, what it is about the babes on Baywatch. I replied, “Too much junk food, safety, and I don’t know.” Later, Spitka asked me if I was really with the CIA and showed me a trunk full of decommissioned machine guns wrapped in red plastic and suggested that they would make nice Christmas gifts for only $250 each. -EA arranges shipping, after all licenses are in and papers signed. What an absurd world we inhabit, I thought while on the train. This morning, I doubted I’d ever find a real tank for sale, and now all I need is an import license and the money. In our market-driven world, you can buy anything for a price, plus shipping. A tank is no exception. But an import license? If I lived in Kyrgyzstan or the Congo, even New Zealand or Germany, such a license might be easy to acquire. But not in America. Homeland Security would laugh at me, or interrogate me, or both. In Vermont, where I live, owning a tank would be beyond politically incorrect. If I parked a T-72 by the brook behind my house, aimed the cannon toward Quebec, and muttered something about protecting my village from an invasion, the police would show up and probably haul me away, even if the cannon was spiked. Still, I asked, posing the same question to myself that I’d asked when I set off on this admittedly wacky quest, why couldn’t a good guy own a tank? A Czech dad drove his kids to school not long ago in his tank, causing a ruckus, but he wasn’t even arrested. A tank is a symbolic rig for now, for militant and security-fixated times. Forget your Hummers and your Smarts: Hummers are so over, and Smarts are just too cute. I’d finally located a tank for sale, but the real challenge was how to get it home. As promised, he’d e-mailed me the prices: $60,000 “as is” for a fixer-upper; $105,000 for a complete rebuild. The prices startled me. You’d pay close to $90,000 for a big, new German supersedan such as a or a Mercedes-Benz E63 AMG. Or, for that matter, for a fancy RV. Not that the creature comforts in the sedans, the road palace, and a combat-ready T-72 – which is low-tech and easy to repair but short on cabin amenities – are comparable. But a tank is mythic, both in design and power. With an impenetrable hide, a fire-breathing snout, a swiveling head, clacking legs, eyes you can’t see, and a few brains in there somewhere, a tank pushes a lot of primal buttons. It’s hard to imagine that anything else you might buy for the prices Doshkov quoted would have quite the same impact. I took another close look at the T-72s huddled together out of the rain. Their numerical designations, faded paint jobs, and tilting fuel drums all seemed to tell stories. Out in the wet, I spotted a broken T-72 just in from Iraq. Treadless, on its road wheels, creamy white and mocha brown, the desert sand eater awaited a sympathetic buyer, one with a courtyard or a war. All he needed was an import license. To the east, cannon barrels crisscrossed. Beyond them flashed the wet, shiny tail of a MiG-21, rebuilt and ready to fly. Jutting above all the cannons and the turrets, it looked like the fin of a big fish escaping green predators. We rounded a corner, and there sat the demo T-72, warming up. It emitted a solid roar, like a blast furnace. Operating fluids were getting hot. Spitka and a driver were going in and out of the hatches. “This is a T-72MK, a commander’s model, going to the American Air Force,” Doshkov said in my ear. The driver soon slipped into the body, his head small and conspicuous. Inside the tight quarters were levers, the kind used in a bulldozer, for pivoting on the treads, an eight-speed transmission, and conventional foot pedals – a clutch, a brake, and an accelerator. And no, I was told, you won’t be driving. It’s too dangerous in such a tight space. I didn’t object. I jumped off the tank, now idling like a revved-up stock car. The driver soon lurched the tank forward, then back. He looked bored, probably wondering what in the hell we were doing this for. Climbing onboard, Spitka slid into the commander’s cockpit with his cockeyed smile and brought the cannon alive. It rose and fell; the turret moved left and right. The cannon finally stopped. It was eerie, having it aimed at me from a couple feet away, threatening to put a hole through me as big as the moon. Uneasy, I sidled away, behind the fender of a big truck. Spitka, the joker, swiveled the cannon horizontally until it was aimed at the photographer, a Czech. Unamused, she held her ground. The scene felt tense for a mo-ment, frightening and vaguely familiar; it could have been Budapest in ’56, Prague in ’68, Tiananmen Square in ’89, Iraq in 2007. But then Spitka appeared, smiling. It was just an Excalibur Army salesman having fun. 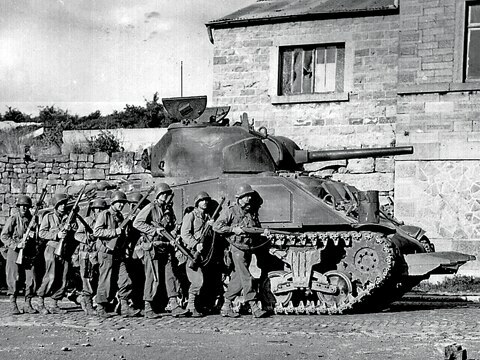 Now, did the American want to buy a tank? I didn’t have an answer. A few months later, I still don’t. But when I walk out through the deep snow in my backyard, I can easily imagine a tank there, painted pink, draped in white, the cannon long and symbolic and disarmed. It would be a remarkable sight. Where should I go to drive a tank? Excalibur Army’s main depot is in Přelouč, an hour east of Prague by train. EA (www.excaliburarmy.cz) is the world’s largest private dealer of military gear, from tanks to military kitchens. Entertainment events include “Tank Power Days,” which usually run from April through September. If you want to drive a tank, this is the place to go. In the United States, two tank-driving outfits – one in Texas, the other in Minnesota – have recently gone cannons up. With two Shermans on the masthead of Automobile Magazine, we couldn’t resist this tribute to America’s armored WWII hero, the Sherman tank.